Moths are closely related to the butterflies, both being of the order Lepidoptera. There are over 160,000 species of moths, more than ten times the number of butterfly species. Butterflies get all of the glory with their bright colors and beautiful wings. Moths on the other hand tend to be more brown and unpretentious. They are not perceived in the same manner as their well loved cousins. But like much of mother nature, you just need to look close enough to see the beauty and glory. 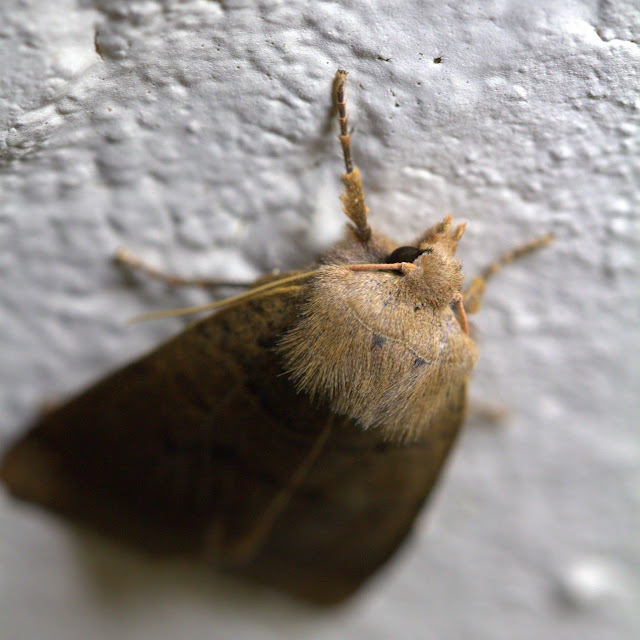 This humble little moth is hanging in close to our front porch light. The macro lens captures some of the fine detail of nature. This photo is also a good example of how shallow the depth of field can be on a macro lens when focused on a very close subject. As you can see the depth of field is less than 1/4 inch. Canon 7D, 1/160 sec @ f/5.6, ISO 800, 100mm macro.